What began as a way to spiff up for Museum of Modern Art gallery openings is now on the verge of becoming a bespoke bow-tie business. Nicholas Ruiz, who founded Made in Forest Hills, is a Florida native with a deep love for his Queens neighborhood and a passion for reviving what other people consider trash. After graduating from Drexel University with a degree in design and merchandising, Ruiz found work at MoMA's department of special programming and events, a position that surrounds him with ongoing inspiration. You might even say that Picasso sparked his first project. While putting the final touches on Picasso: Guitars 1912–1914 the night before it opened, Ruiz decided to pay homage to the grandmaster himself by constructing a bow tie from colored guitar picks, a wooden hanger, and superglue. The result was the first in what would eventually become his “Bow Tie Collection,” a series of 11 ties inspired by exhibits at MoMA over the course of 2011. 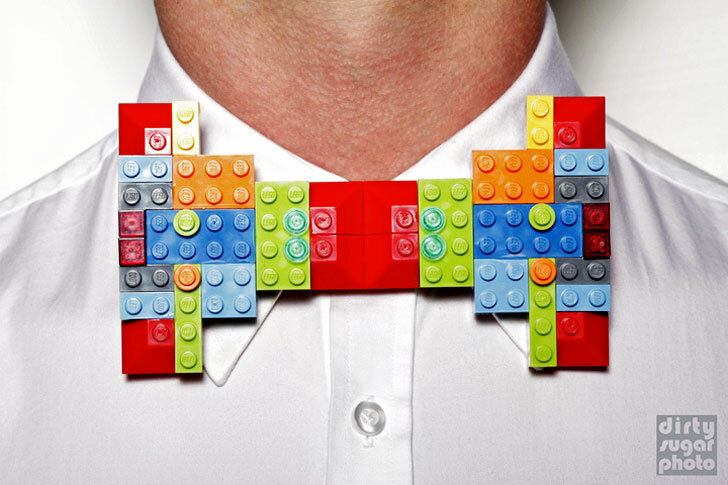 For the Armory Show after-party, Ruiz created a bow tie using Legos from his childhood. For the Armory Show after-party, Ruiz created a bow tie using Legos from his childhood. 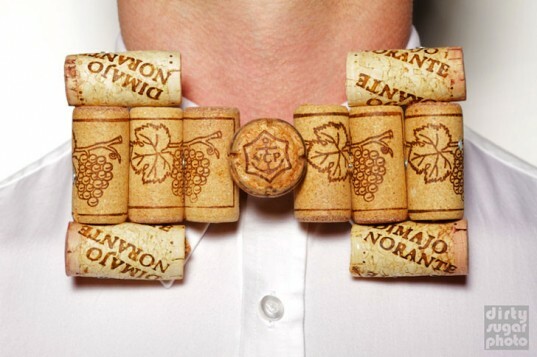 When he needed to gussy up for the launch of German Expressionism: The Graphic Impulse, he turned to wine corks from the restaurants of his favorite chef, Jose Garces. “Since then, I’ve become increasingly more fascinated, or some would call obsessed, with bow ties,” he tells Ecouterre. “Obsessed” doesn’t even begin to cover it. Ruiz has sought out other bow-tie aficionados, including Jeff Vasquez, a New York City math teacher who launched 1,000 Days of Bow Ties to commemorate his 1,000th consecutive day of teaching. Besides wearing a bow tie every day for the next 1,000 days, some of them courtesy of Ruiz, Vasquez will also be raising money for the Achievement First network of public charter schools in Brooklyn and Connecticut. He plans to adapt his designs so they can be worn as brooches, necklaces, and hair accessories. For his first post-MoMA outing, Ruiz will draw his cues from Forest Hills itself, perhaps using salvaged Lincoln Logs. Future collections, he hints, will feature more conventional—and work-appropriate—fabric forms, although he’ll make sure to incorporate zany prints for nights on the town. While putting the final touches on Picasso: Guitars 1912–1914 the night before it opened, Ruiz decided to pay homage to the grandmaster himself by constructing a bow tie from colored guitar picks, a wooden hanger, and superglue. 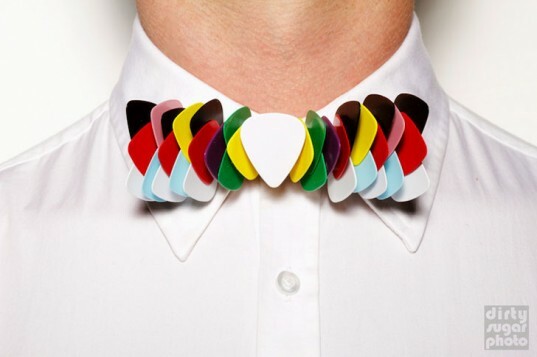 The result was the first in what would eventually become his "Bow Tie Collection," a series of 11 ties inspired by exhibits at MoMA over the course of 2011. For the Armory Show after-party, Ruiz created a bow tie using Legos from his childhood. When he needed to gussy up for the launch of German Expressionism: The Graphic Impulse, he turned to wine corks from the restaurants of his favorite chef, Jose Garces. "Since then, I've become increasingly more fascinated, or some would call obsessed, with bow ties," he tells Ecouterre. "Obsessed" doesn't even begin to cover it. Ruiz has sought out other bow-tie aficionados, including Jeff Vasquez, a New York City math teacher who launched 1,000 Days of Bow Ties to commemorate his 1,000th consecutive day of teaching. Besides wearing a bow tie every day for the next 1,000 days, some of them courtesy of Ruiz, Vasquez will also be raising money for the Achievement First network of public charter schools in Brooklyn and Connecticut. Ruiz, who intends to sell his bow ties online, will be launching a Kickstarter campaign to invite custom orders and cover initial costs. Regarding made-to-order designs, Ruiz exclaimed, "I'm itching to design wedding bow ties for a bride and groom, bride and bride, or groom and groom!" For his first post-MoMA outing, Ruiz will draw his cues from Forest Hills itself, perhaps using salvaged Lincoln Logs. Future collections, he hints, will feature more conventional—and work-appropriate—fabric forms, although he'll make sure to incorporate zany prints for nights on the town.